These cards are great as you can certainly make them yourself but they are also a great project to get your kids involved in. Kids Love doing craft projects and are usually quite eager and proud to help out as well. The centerpiece of these Thanksgiving cards is a classic kids crafts project. The turkey made from tracing a child's hand! I don't know what the official name would be :) The recipients of these cards will love them all the more for having your children's artwork on them. Especially family members. 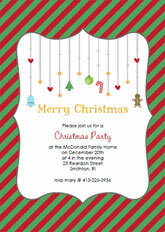 Set your kids to work with some construction paper and they will create the most important part of these invitations for you. 1. First trace out a handprint onto some brown construction paper. 2. Cut out the hand with some scissors. This will become the body of the trkey. The thumb is the turkey's head and neck and the rest of the fingers are the turkey's feathers. 3. Now trace and cut out several more hand prints in different fall colors like red, orange, and purple. Tear the fingers off to decorate the feathers. 4. Cut our little feetand legs, and beaks out of yellow paper. I used a small circular paper punch to punch out the shape for the eyes but these can be drawn on too. Cut little oval tear drop shapes from red to place below the turkeys beak to if you want. 5. Now use glue sticks or craft glue to glue it all together. Let your kids decorate the turkey however they see fit! I went a little further with this idea and provided decorative scissors for the feathers as well. Give your kids an array of different craft supplies (crayons, markers, lots of paper, paper punches and decorative scissors) and let them go wild with it. You never know what kind of creative ideas they may come up with. Ok so here's where mom can take over a little bit (but of course kids can still help. To make this project the the easiest it can be I reccomend using blank cards to put together these thanksgiving holiday cards. Blak cards make the job fast and easy and usually come with envelopes to boot. 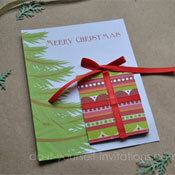 You can also make the cards from scratch using a piece of cardstock. For a larger sized card simply fold the cardstock in half. For smaller sized cards cut your cardstock in half first and then fold these pieces in half. If you prefer to print a message onto the inside of the card go for it. Otherwise start by simply folding the cards in half. 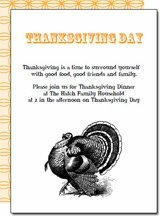 Next get on your computer and print out a Happy Thanksgiving message to make the turkey's apron for the front of the card. Create the text so that one word is over the other and center them both. Try to fit as many onto one sheet of paper as you can. What I did to make this step easier is print them onto the back of index cards. That way I could fit 3 or 4 on a card. This made it easier to cut them out centered. To do this just choose the "page setup" or "document setup" option under "file". Set the page diameters to match the index cards. When printing you will need to set these diameters in your printeroption as well to get it to print correctly. Once you have printed the text out use a pair of decorative edge scissors to cut around three sides of the text. 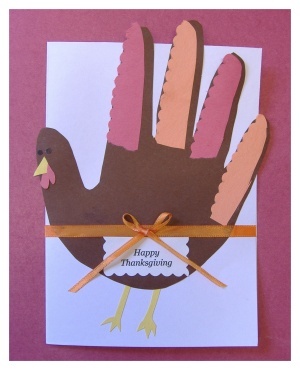 Using glue stick or craft glue attatch the handprint turkeys to the front of your cards. Next attatch the small apron "thanksgiving" text ornament to the turkey. Cut out a length of orange or red ribbon and apply some craft glue to the back of this ribbon. Attatch it to the front of the card horizontally so that it covers the top of the turkey's "Happy Thanksgiving" apron. Now tie some small bows using the same ribbon. Attatch these to the front of the card by dipping their centers into some craft glue and applying pressure to them. Leave them to dry for about 10 minutes. * For some added Thanksgiving them touches why not add a pilgrim hat to the turkey or a black construction paper belt buckle onto the ribbon instead of a bow. * Supply as many craft supply items as you can for your kids to use. They may think up some very creative and neat ideas to make their handprint turkeys. 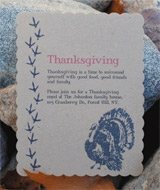 * These need not only be used as Thanksgiving holiday cards - they can also be made into Thanksgiving dinner invitations. Just change the wording on the front to "You're Invited".